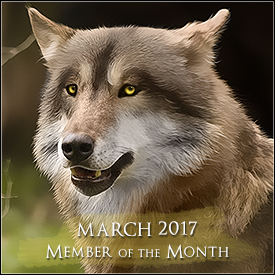 Of the Month Winners for March! Again, big thank you to Kydnt for the avatars! Jacqueline is an amazing writer and an incredibly active member, despite having only one character (we all wonder how she does it!). She sets a great example of what sort of interesting, crazy plots can arise through minimal ooc planning, which is part of what makes Lorcan's development so engrossing. No one knows what will happen! Jacqueline has also been very kind when it comes to gifting art to other members or offering to make avatars for puppies, and very skilled to boot! Congrats, Jacqueline! Lilya has come such a long way since she entered Relic Lore (literally a year ago yesterday, wow!) as a scared, yearling female too afraid to settle down in a pack for fear of being found by those that targeted her family. Since then she's served a stint as the leader of Hearthwood River in Kisla's stead, and found a fast and deep bond with her former co-leader Lachesis. She was recently attacked by Mittani of WHITESTONE MONADNOCK, which has incited some very interesting drama as now her pack is forced to reconsider its alliances with the Rock of the North. Lilya is always an interesting read and we can't wait to see how pregnancy and eventually puppies affect her development. Congrats, Lilya! If you would like us to consider other options please let us know. The longstanding, unwritten policy regarding pack membership allowed wolves to leave the pack for any amount of time without being "kicked out" of their pack. Pack membership was sort of up to a Leader's in character interpretation of whether or not a wolf would be coming home, however this policy has caused many logical confusions over the years and we felt that it was time to address this so as to minimize instances where people avoid LP docks for being a lone wolf. Logically, if a wolf is away from their home for a long time they would cease to smell like their pack and would not benefit from the support of many wolves to hunt or protect them. Therefore, To retain pack membership, a wolf is expected to regularly be within the boundaries of their home. Wolves need each other's support to survive and thrive. Wolves that go out on long journeys will not have the protection or aid of their fellow pack members, and will eventually lose the scent of their pack. If a wolf leaves the territory for longer than two months without returning they will be removed from their pack rosters, and if they rejoin they will not regain their previously held rank. 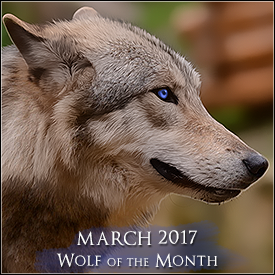 A leader may agree or give their blessings for trips two months or longer, but the wolf will still be removed from the roster and must "rejoin" when they return. Finally, we have posted our 2017 Cub Adoption listing up in Wolf Central. You can check it out here! Instructions for adopting a puppy can be found in the first post of the thread. Expectant parents, please see the first post of the thread for your character's due date. It isn't required that you begin your thread on the date posted, but it cannot be started before that date. 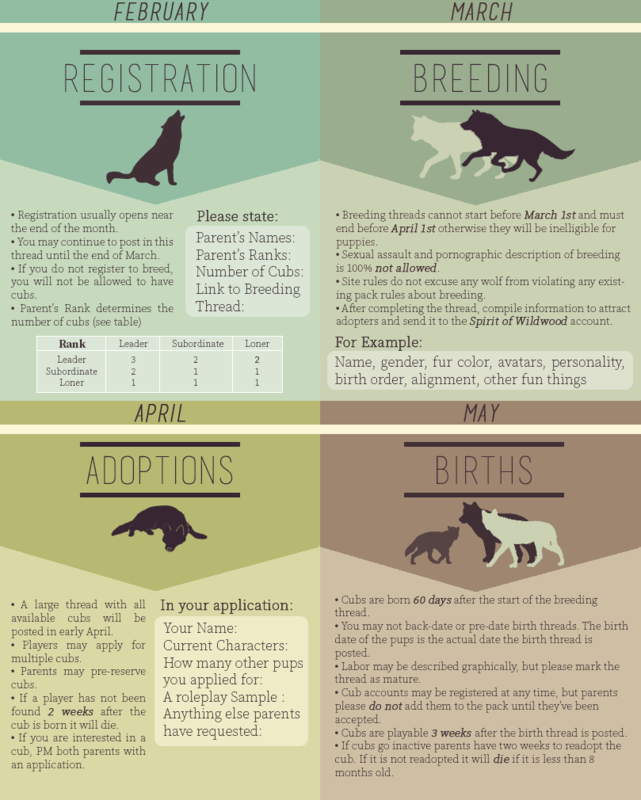 Puppies will be playable beginning three weeks after their birth date.